Equipped with both WiFi and Bluetooth wireless technologies, the AVR-X2100W A/V receiver lets you listen to your favorite tracks from your portable audio player, smartphone and tablet, as well as from your home network. Choose from a wide range of internet radio stations, and listen to your favorite tracks from music streaming services such as Pandora, SiriusXM and Spotify. You can also listen to tracks on your DLNA home PC or Mac, and the AVR-X2100W is equipped with dual RF antennas for maximum Bluetooth and WiFi reception quality. The powerful 7 channel amplifier section features identical power amp design on all channels along with high current discrete power output devices. Rated at 95 watts per channel (8 ohms, 20 Hz~20 kHz, .08% THD), the AVR-X2100W is also rated to drive lower impedance speakers, down to 4 ohms. Our new Eco amplifier mode automatically adjusts power output based on volume level, and an on-screen Eco meter lets you see the power consumption savings in real time. Featuring Audyssey's Silver suite of advanced DSP audio processing algorithms, the AVR-X2100W includes Audyssey MultEQ XT automatic room acoustic measurement and correction system, as well as Audyssey Dynamic Volume and Audyssey Dynamic EQ. For the ultimate video experience, the AVR-X2100W features an advanced video section with 8 HDMI inputs including 1 conveniently located on the front panel, all rear HDMI inputs are equipped with Ultra HD 4K full 60 Hz frame-rate pass-through and Ultra 4K upscaling. The AVR-X2100W also features Pure Color 4:4:4 color sub-sampling pass-through, another feature of the latest HDMI specification. Stream your favorite tracks wirelessly to the AVR-X2100W via Bluetooth and WiFi. The Bluetooth wireless feature remembers up to 8 different Bluetooth source devices, and features automatic power on and pairing. Via your WiFi home network, you can stream your favorite tracks from Pandora, SiriusXM and Spotify subscription services (not all services available in all markets). You can also choose from thousands of internet radio stations. Dual antennas assure reliable and stable Bluetooth and WiFi transmission and reception. You can also stream your favorite music from your Apple devices, including the iPod touch, iPhone and iPad via the built-in AirPlay feature. Content on your PC or Mac via the DLNA 1.5 compatibility is even possible. An RJ-45 wired LAN port is provided for direct connection to your home network. The advanced audio section features the latest high resolution lossless audio decoders, including Dolby TrueHD and DTS-HD Master Audio. The AVR-X2100W also features Dolby Pro Logic IIz, which uses advanced psychoacoustic algorithms to derive front height channels from stereo, surround and discrete surround soundtracks, dramatically expanding the front soundstage. And, the AVR-X2100W gives you the option of using 2 of the available amp channels to drive the front height speakers with a 5.1 setup, or connect a stereo amp to the pre-outs to drive the front height speakers. With the supplied Quick Setup guide along with the intuitive on screen Setup Assistant, you'll have the AVR-X2100W configured quickly and easily. You can even control the setup via your PC's web browser, our use our available iOS and Android Denon Remote Apps with your smartphone or tablet. The powerful amplifier section features identical circuit design for all 7 channels, with equal power across all channels as well. The AVR-X2100W is conservatively rated at 80 watts per channel (8 ohms, 20 Hz~20 kHz, .08% THD), and all channels are able to safely drive lower impedance 4 ohms speakers. As the first A/V receiver manufacturer to embrace Audyssey's advanced DSP audio algorithms, Denon has introduced the most Audyssey-equipped products, and the AVR-X2100W features the Audyssey Silver suite of DSP functions, which includes MultEQ XT, Dynamic EQ and Dynamic Volume. Audyssey MultEQ XT automatic room acoustic measurement and correction system matches your speakers to your room's acoustics, for the smoothest, most natural tonal balance. MultEQ XT provides greater filter precision for the main and satellite speakers, with 8x the resolution compared to the base MultEQ system, and provision for measuring at up to 8 locations in the room. Audyssey Dynamic EQ uses advanced psychoacoustic algorithms to continually adjust tonal balance so that the sound you hear is full range, even at lower volume levels, and Audyssey Dynamic Volume smoothes out annoying volume jumps, especially with too loud commercials. With the AVR-X2100W's dual subwoofer outputs, you can connect two subwoofers and place them in different parts of the room to enjoy smoother and more accurate deep bass response. 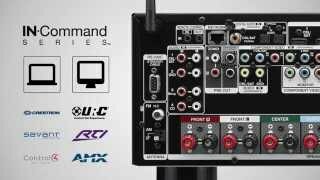 As part of Denon's IN-Command series of custom integration friendly A/V components, the AVR-X2100W is equipped with a range of features that provide enhanced control capabilities and compatibility with 3rd party and custom integration solutions. For remote control compatibility with other components in your home theater system, the AVR-X2100W features an IR (infrared) remote control input on the rear panel. The AVR-X2100W can also be set up and operated by a home computer on the network via IP control, either via wired LAN connection or via WiFi wireless connection. The AVR-X2100W also features Control4 SDDP (Simple Device Detection Protocol) certification for quick and easy integration with Control4 home automation equipment.